Poor Joseph! Everything seems to be going against him in his life. Sold into slavery, falsely accused, and thrown into prison. It looks like he has been totally abandoned, but we know that's not true. We have the full story, but Joseph didn't. God was with Joseph. He never left him. God was prospering Joseph in the midst of his suffering. He showered Joseph with His mercy and with His favor. Because Joseph remained faithful to God during his times of suffering. Joseph didn't blame God for what was happening to him. Instead Joseph served faithfully wherever he was at...in the palace or in the prison. Unlike the chief butler, God never forgot about Joseph. God had a plan for Joseph's life - a good plan. God's got a good plan for your life too. Maybe you can't see now how that plan is going to work out for your good, but you can trust God. He will never leave you nor forsake you. Your circumstances may not be the best right now, but know this - God loves you and He is faithful. Remain faithful to Him and He will see you through. I love this song by Matt Redman, "Never Once", that reminds me of God's faithfulness during the hard times of my life. I hope you'll listen to it and find the same encouragement that I do. God is faithful. Let's be faithful to Him too. 2 The Lord was with Joseph, and he was a successful man; and he was in the house of his master the Egyptian. 3 And his master saw that the Lord was with him and that the Lord made all he did to prosper in his hand. 21 But the Lord was with Joseph and showed him mercy, and He gave him favor in the sight of the keeper of the prison. 23 The keeper of the prison did not look into anything that was under Joseph’s authority, because the Lord was with him; and whatever he did, the Lord made it prosper. Observations: Four times it is repeated that the Lord was with Joseph, and two times it says the Lord prospered whatever Joseph did. God showed Joseph mercy and gave him favor during this terrible time in his life. He was abandoned by his brothers, but not by God. Joseph was in a foreign land, but he had God with him. He chose to live a faithful life to God in the midst of difficult and tempting circumstances. In doing so, God prospered whatever Joseph did. Application: There may be times in our lives when we feel like everyone has abandoned us, but God will never leave us nor forsake us (Deuteronomy 31:6). God is with us during our darkest days raining down his mercy and favor. Am I faithful to God during the difficult times of my life? Do I look for the handprints of God working in my favor during hard times? Do I use the grace of God available to me as His child to resist temptations that come my way? Prayer: Heavenly Father, thank You so much for the gift of Your mercy and Your grace! Help me to stand firm as Your child in this temporary world while I wait for my true home with You. When it seems like everything or everyone is coming against me, help me to find Your handprints working out every situation for my good because Your favor rests on me. I thank You and I love You. In the saving name of Jesus I pray. Amen! 14 But remember me when it is well with you, and please show kindness to me; make mention of me to Pharaoh, and get me out of this house. 15 For indeed I was stolen away from the land of the Hebrews; and also I have done nothing here that they should put me into the dungeon.” 23Yet the chief butler did not remember Joseph, but forgot him. Observations: Joseph shared his heart when he pleaded his case with the chief butler, hoping that by doing so he would be remembered and spoken favorably of so that he would be released from prison. The chief butler, when released from prison as Joseph correctly interpreted from the dream, forgot all about Joseph. Application: I want to be a better friend than the chief butler was to Joseph. Joseph had been there for him during the chief butler’s time of need – when he had no one who could interpret his dream. I want to remember others who are suffering and are in need. If there is anything that I can do to help, I pray that I won’t be so wrapped up in myself that I forget to reach out to others. Prayer: Heavenly Father, I’m so thankful that You never forget about me. You’re always with me, loving me, and caring for my needs. At the darkest time of my life, You reached down with loving hands and raised me up with new life in Christ. Thank You for sending Your only Son, Jesus, to die for my sins. Thank You for the power of Your Holy Spirit living within me enabling me to be who you’ve created me to be and to do what You’ve called me to do. I pray that I would love others as You have so graciously loved me. I pray that I would never be so busy with life that I forget about the circumstances of the lives of others and what they may be going through. In the loving name of Jesus I pray. Amen! Here is our reading plan for next week! Have a great weekend and I'll see you back here on Monday for another Blogging Through the Bible post. 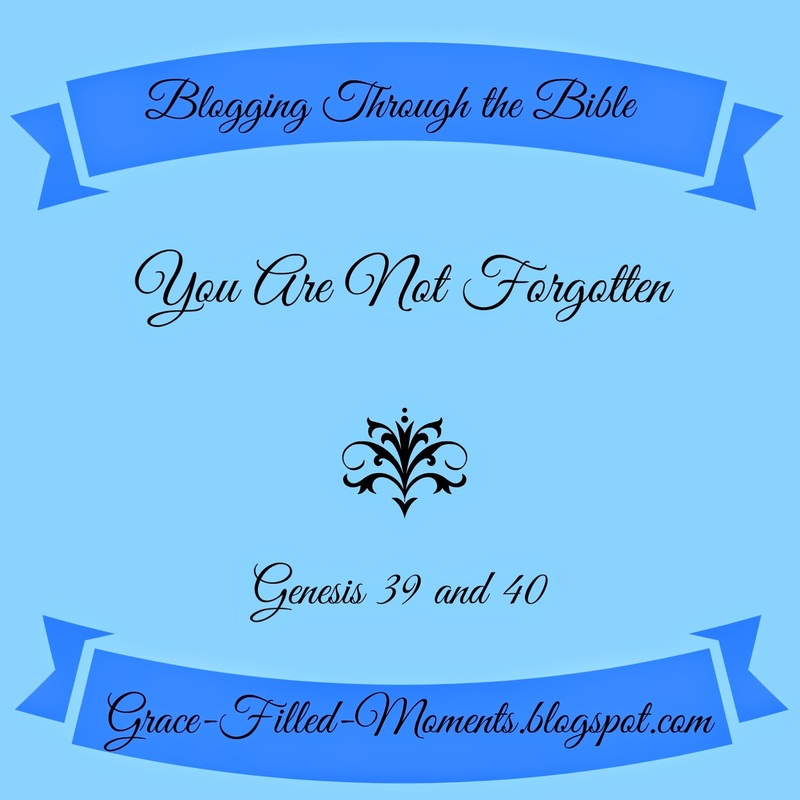 Read other Blogging Through the Bible posts simply by clicking on the image below. 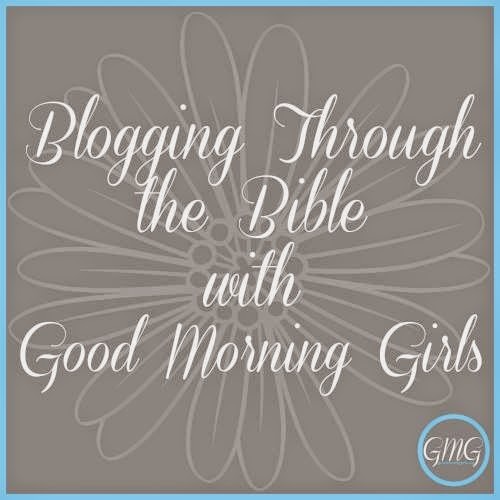 Thanks to Courtney Joseph and the Good Morning Girls for leading us on this journey through the Bible!